From 19 October 1807, her married name became Drummond-Burrell.1 After her marriage, Lady Sarah Clementina Drummond was styled as Baroness Gwydyr on 29 June 1820. Priscilla Barbara Elizabeth Bertie, Baroness Willoughby de Eresby was born on 16 February 1761. 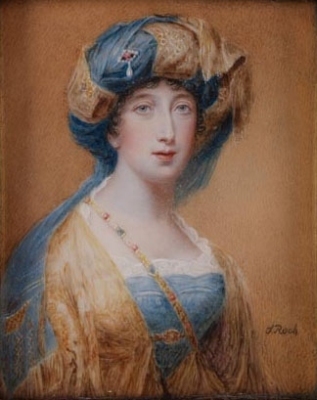 She was the daughter of General Peregrine Bertie, 3rd Duke of Ancaster and Kesteven and Mary Panton.2,3 She married Peter Burrell, 1st Baron Gwydyr, son of Peter Burrell and Elizabeth Lewis, on 23 February 1779 at Berkeley Square, London, EnglandG.4 She died on 29 December 1828 at age 67. Her married name became Burrell. She succeeded as the 21st Baroness Willoughby de Eresby [E., 1313] on 18 March 1780, suo jure.5 After her marriage, Priscilla Barbara Elizabeth Bertie, Baroness Willoughby de Eresby was styled as Baroness Gwydyr on 16 June 1796. [S15] George Edward Cokayne, editor, The Complete Baronetage, 5 volumes (no date (c. 1900); reprint, Gloucester, U.K.: Alan Sutton Publishing, 1983), volume V, page 140. Hereinafter cited as The Complete Baronetage. [S15] George Edward Cokayne, The Complete Baronetage, volume V, page 140, says she was the daughter of Elizabeth Blundell, her father's first wife. However Elizabeth died in 1745, making this extremely unlikely. [S6] Cokayne, and others, The Complete Peerage, volume I, page 130. [S6] Cokayne, and others, The Complete Peerage, volume III, page 256. From circa November 1654, her married name became Bertie. After her marriage, Mary Massingberd was styled as Countess of Lindsey on 25 July 1666. [S6] G.E. Cokayne; with Vicary Gibbs, H.A. Doubleday, Geoffrey H. White, Duncan Warrand and Lord Howard de Walden, editors, The Complete Peerage of England, Scotland, Ireland, Great Britain and the United Kingdom, Extant, Extinct or Dormant, new ed., 13 volumes in 14 (1910-1959; reprint in 6 volumes, Gloucester, U.K.: Alan Sutton Publishing, 2000), volume II, page 140. Hereinafter cited as The Complete Peerage. 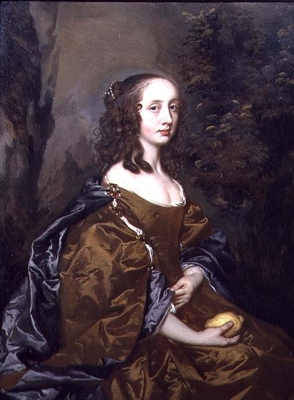 Elizabeth Wharton was the daughter of Philip Wharton, 4th Lord Wharton and Elizabeth Wandsford.1 She married Robert Bertie, 3rd Earl of Lindsey, son of Montagu Bertie, 2nd Earl of Lindsey and Martha Cokayne.1 She died in 1669. After her marriage, Elizabeth Wharton was styled as Countess of Lindsey. Her married name became Bertie. [S6] Cokayne, and others, The Complete Peerage, volume I, page 127. Lady Finetta Pope is the daughter of Thomas Pope, 3rd Earl of Downe and Beata Poole. She married Robert Hyde, son of Rt. Rev. Alexander Hyde and Mary Tounson. [S1457] Paul W. Harding, "re: British Admirals-Age of Nelson," e-mail message to Darryl Lundy, 10 September 2005, says 10 April 1854. Hereinafter cited as "re: Age of Nelson." 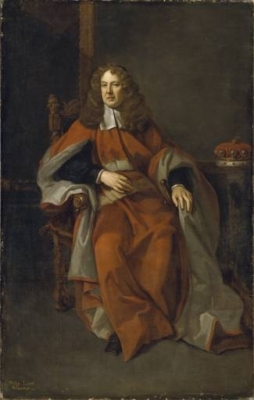 Philip Wharton, 4th Lord Wharton was born on 8 April 1613.3 He was the son of Sir Thomas Wharton and Lady Philadelphia Carey. He married, firstly, Elizabeth Wandsford, daughter of Sir Rowland Wandesford, on 23 September 1632.3 He married, secondly, Jane Goodwin, daughter of Arthur Goodwin, in 1634.4 He married, thirdly, Anne Kerr, daughter of William Kerr, between 24 August 1661 and 26 August 1661.4 He died on 5 February 1695/96 at age 82.